Blocked pathways caused by bike-sharing bicycles strewn all over the place has been an increasing problem for pedestrians and the government. There was also a case of a couple who dumped their bikes into a canal after using them, and two cases of people throwing the bikes down a block of flats. 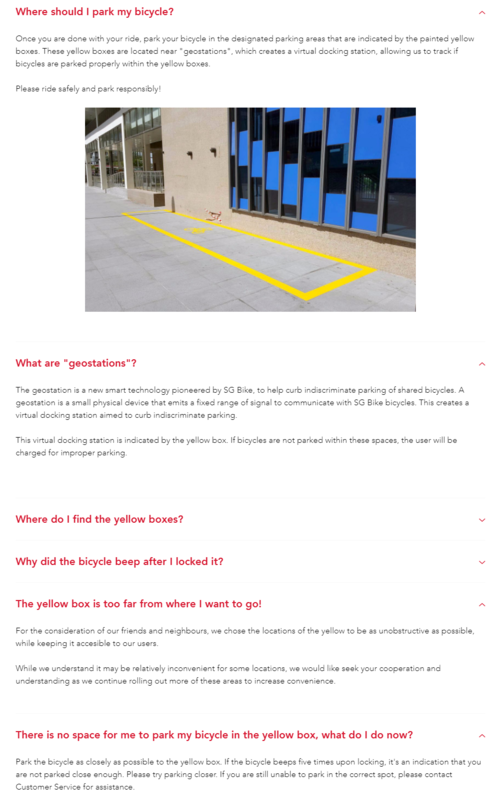 Last year, two new entrants to the bike-sharing race, GBike and Baicycle, introduced the concept of a geo-fencing feature that aimed to combat indiscriminate parking. Now, it seems the government has taken on the same method to deal with rogue bike-sharing users who park their bicycles irresponsibly, by introducing a new regulatory framework that uses QR code geo-fencing. The Land Transport Authority (LTA) will implement a QR code geo-fencing solution that users must scan “as proof of proper parking”. 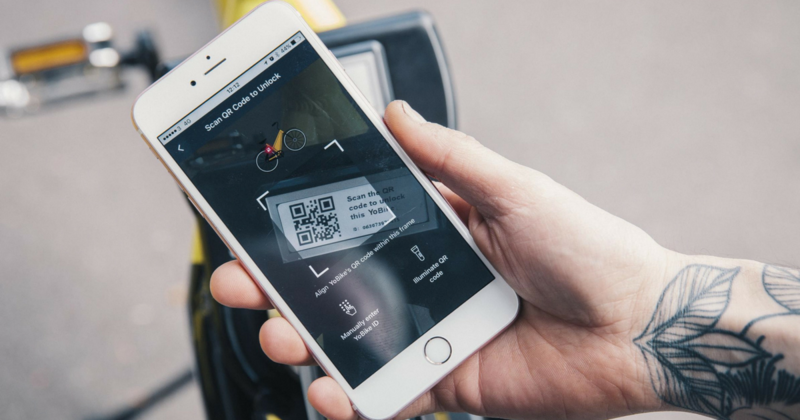 Under this regulatory framework by the LTA, bike-sharing companies in Singapore such as ofo, oBike, and Mobike “will have their fleet size reviewed” every half a year “based on how well they address the issue of bike parking by their users”. It is also reported that these companies have to suspend users who have committed bike parking offences multiple times. Bike-sharing companies are required to comply to these regulations or be fined up to $100,000, reduce their fleet size, be suspended, or have their licenses revoked. This comes after news last year of LTA signing an agreement with bike-sharing companies and relevant stakeholders to “encourage the responsible use of shared bikes in public spaces such as public paths and parks”. Five bike-sharing firms, namely ofo, GBikes, Mobike, oBike, and SG Bike, were supposed to “adopt geo-fencing technology” by the end of 2017. That agreement was put in place so companies would know if their bicycles were parked at designated parking zones, and if not, to take necessary actions on irresponsible users. Let’s take a look at some of these companies’ current penalties and rates. 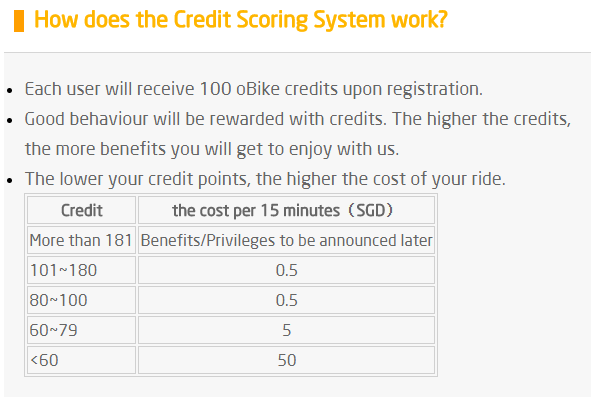 Local bike-sharing company oBike operates on a credit system. Each user is credited with 100 points at the start of their account and will be accumulated or deducted according to how they use the service. Users have to deposit $49 to start riding oBike bicycles. 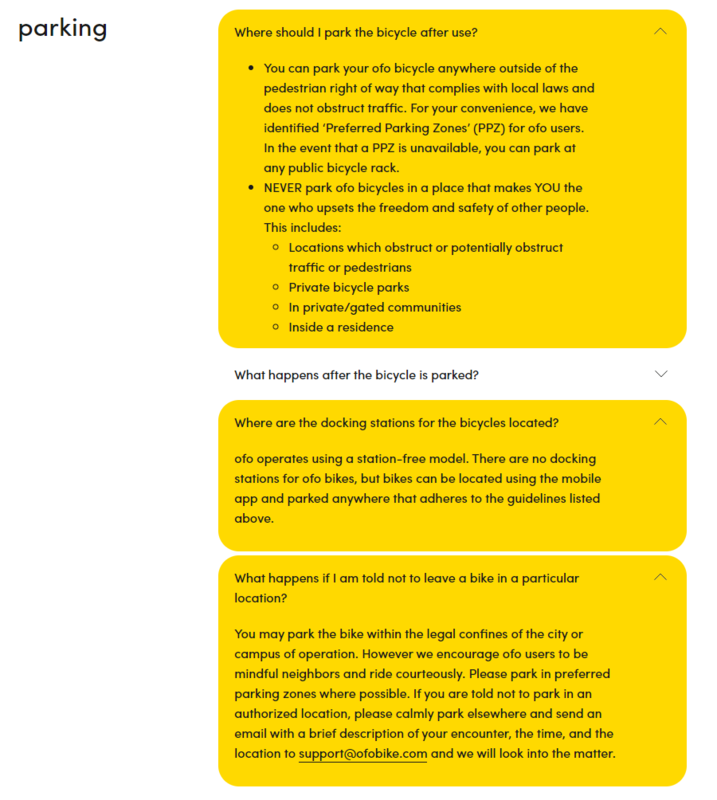 It seems Alibaba-backed bike-sharing company ofo does not have penalties set in stone. Perhaps there isn’t a dedicated FAQ on parking or penalties for Singapore users, yet. For Singapore users, rates are at S$1 per hour. No deposit is required to start riding ofo bicycles. Similarly, Tencent-backed bike-sharing company Mobike does not enforce penalties on their users. They have come up with a detailed guide on where to park and where to not park. Mobike users have to deposit $49 to start using its bicycles, and charges $0.50 per 30 minutes. 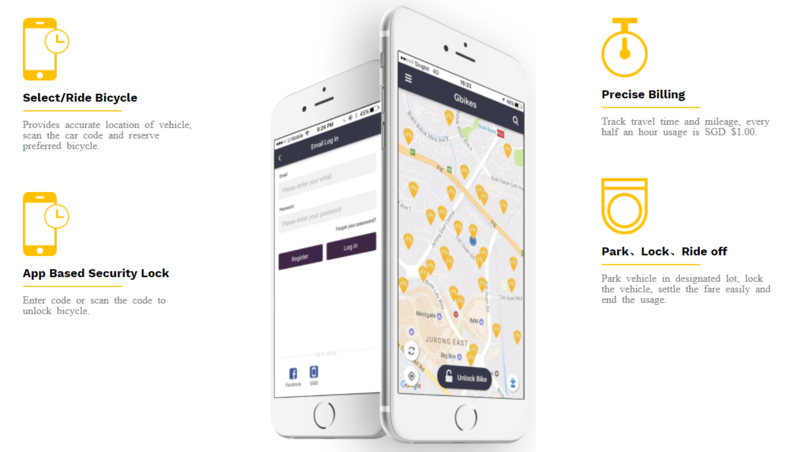 Another local bike-sharing company GBikes takes on a similar approach to oBike’s credit system, rewarding positive user behaviour with reward points, called Gpoint. Should a user’s Gpoint fall below 80, they will be “put through a probation period of 14 days with increased rate of $3 for 30 minutes” and they’d have to complete at least three trips under their “agreeable behaviour” to have their points raised back to 80. Users riding GBikes’ bicycles have to deposit $49 and every half hour cost $1. SG Bike, another local bike-sharing firm, was one of the first to implement the geo-fencing feature. 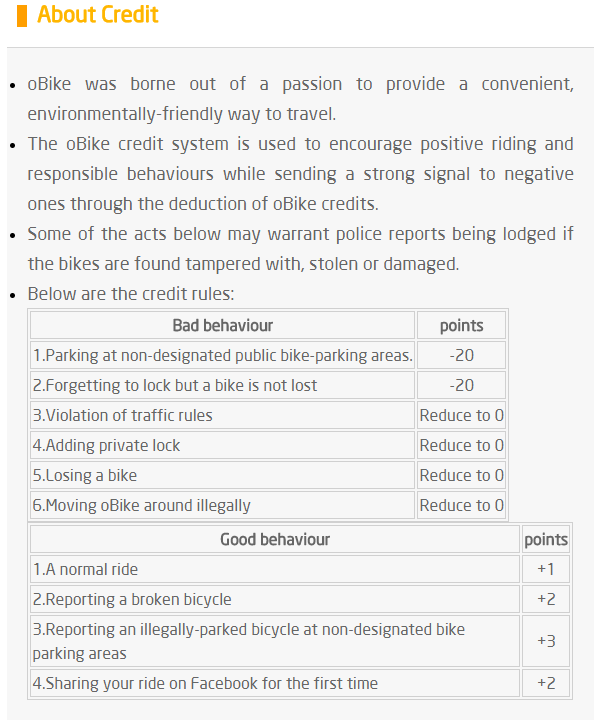 So far, it seems only local bike-sharing companies have some form of penalties imposed on users to deter bad behaviour. Perhaps global bike-sharing companies ofo and Mobike take some time to come up with a similar and effective penalty system because they’d have to understand operations at a municipal level. Hopefully, this means we will see more organised parking of these bikes and more unobstructed pathways for pedestrians – especially with the increasing number of personal mobility device (PMD) riders who share the pathways too. But for frequent users of these bikes, they may experience more inconveniences as they’d have to walk to a designated bike parking spot to redeem a bike and then dock it at another designated parking spot that could be further from their destination after use. Personally, I do not use these bikes frequently, but they come in really handy when I need to go somewhere in the neighbourhood that takes about 20 minutes of walking to get there. Overall, it is important that walkways with high footfall and pavements close to heavy traffic are made safe for everyone, so this regulation is definitely a welcome move. What do you think of this new implementation? Let us know in the comments.